Educational Visits at Devil's Bridge Waterfalls & Nature Trail01970 890233work Educational VisitsThe 300ft Mynach Waterfalls are set deep withing the ancient wooded gorge. It's damp atmosphere creates a perfect habitat for rare mosses as well as different varieties of fern and other plants. The waterfalls are a good example of a hanging valley and the deep pools show erosion. The coloured lichen can be seen on the trees and rocks all the way around the nature trail. An impressive tilted slate rock face can be seen as you descend Jacob's Ladder. The unique Three Bridges built on on top of each other is an impressive architectural fete considering the age and location of them. Under the three bridges there is what's called The Devil's Punch bowl which shows how the water force has smoothed the rock into a circular shape. The different layers of rock can clearly be seen from the lower view point. The legend is part of the beginning of tourism in this area dating back to the 18th Century. Educational literature available on request. 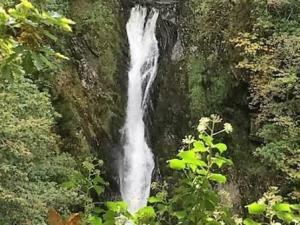 The 300ft Mynach Waterfalls are set deep withing the ancient wooded gorge. It's damp atmosphere creates a perfect habitat for rare mosses as well as different varieties of fern and other plants. The waterfalls are a good example of a hanging valley and the deep pools show erosion.